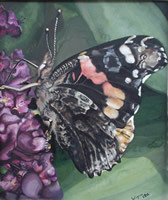 Sarah Wegner is an accomplished watercolorist. She began her studies at Glen Oaks College in Michigan. She developed her unique technique of layering watercolors and mixing them with a traditional wash technique. Her subjects appear so realistic that they are often mistaken for photographs. © Sarah Wegner 2005 All rights reserved.